Google Lat Long: Google Maps now on Twitter! 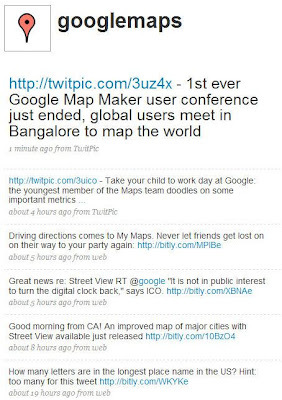 Google Maps now on Twitter!
. @GoogleMaps will share information on cool uses and product tips for Google Maps, behind-the-scenes musings from Googlers and general goings-on in the mapping world. We're also going to use Twitter to listen to the things that you want to suggest and say to us. "Twitter?," some may ask. It's the 140-character "microblogging" site that's gained a huge fan base from both individuals and organizations – and we're glad to be joining the ranks. We think it will be a great community and home for the Google Maps team, and we hope that you'll follow us there. Here's how: if you're already using Twitter, simply click here and choose "follow". If you're not using Twitter yet, sign up here – it's easy, and free – and then "follow" GoogleMaps. This blog won't change at all based on our use of Twitter - except in one way: in the right sidebar, you will now see a live feed of recent tweets and a new link that will bring you to our Twitter account. See you there! Want to know what's on our minds or what we're up to at any given moment? Google Maps is now talking on Twitter under the name GoogleMaps. @GoogleMaps will share information on cool uses and product tips for Google Maps, behind-the-scenes musings from Googlers and general goings-on in the mapping world. We're also going to use Twitter to listen to the things that you want to suggest and say to us.